Synopsis: A spoiled heiress, running away from her family, is helped by a man who is actually a reporter in need of a story. Did You Know? 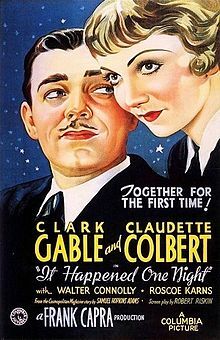 This was the first film to win the Big Five Oscars: Picture, Lead Actor, Lead Actress, Director, and Screenplay. Quotables: ELLIE: How did you get the car? PETER: I gave him a black eye for it. And had to tie him around a tree. Yet another film that makes humour out of flagrant sexism: from mansplaining to unwanted sexual advances. But of course it does, it’s from the 1930s. Why ever would I expect anything different? I cannot stand Gable’s domineering arrogance. But worse than him is the scumbag on the train persistently making passes at Ellie (Colbert), despite her rejecting his advances; he doesn’t take no for answer until Peter (Gable) intervenes and insists that she’s his wife. The creepy scumbag is then apologetic to Peter, because how dare he try to stake claim on another man’s property, right? This film may have been the “romance of the century” during Hollywood’s golden age, but it certainly does not stand the test of the time.